‘Convocation’ was an artist residency and exhibition of works created in response to the legacy of 6th-century Irish monk Colm Cille. This interdisciplinary project involved historians and practitioners from contemporary art, design and architecture. The aim was to create new knowledge through making contemporary responses to the extreme past. 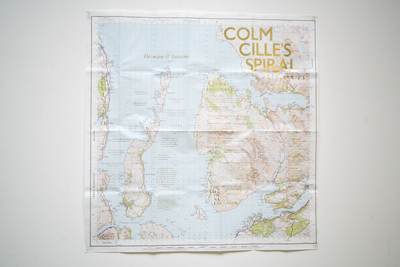 ‘Convocation’ was one of six projects taking place at locations across UK and EIRE, as part of ‘Colm Cille’s Spiral’. ‘Convocation’ was curated by Jenny Brownrigg. 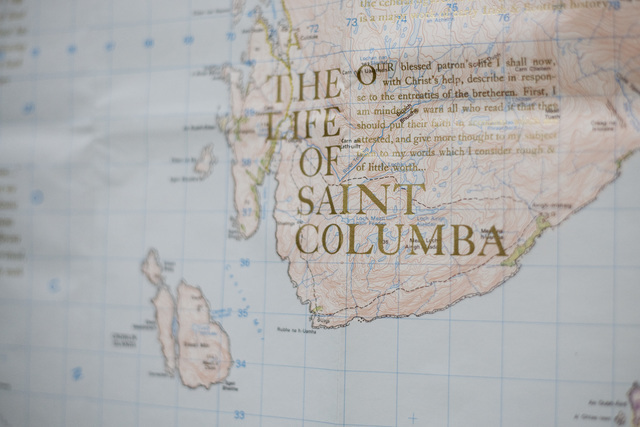 Researchers, artists and curators participated in a week-long residency on Raasay, off Skye, contemplating the island as the centre of thinking, beyond which lay ‘the peripheral imagination’. The format of the event itself echoed the dynamic of the ‘spiral’ rather than a circle or cycle, with the group gathering on Raasay, Skye (Ruminatio), then dissipating (Meditatio), then re-gathering in Glasgow (Revelatio). During the Raasay residency the group was asked to respond to a series of questions delivered by Medievalists Professor Clare Lees and Kathryn Maude (King’s College London). It was felt important that the questions could lead to ‘open creative acts’, allowing space for those involved to interpret and misinterpret. The questions looked at: aspects of time; the monastery; spirit and landscape; ‘The Life of St Columba’ by Abbot Adomnán; ‘Peregrinatio’ (Latin for pilgrimage); and The Spiral. The project found a new interdisciplinary model for bringing together academics, arts organisations and practitioners at all stages of their career to respond to a historical subject. The project as well as being interdisciplinary, was also a new collaboration of organisations, including Higher Education Institutions, public institutions and contemporary arts organisations. Following the Raasay residency, a symposium event was held at the Centre for Contemporary Arts in Glasgow which included new sound work by Emma Balkind, and talks by Professor Clare Lees, and Thomas Clancy and Dr Katherine Forsyth of University of Glasgow. 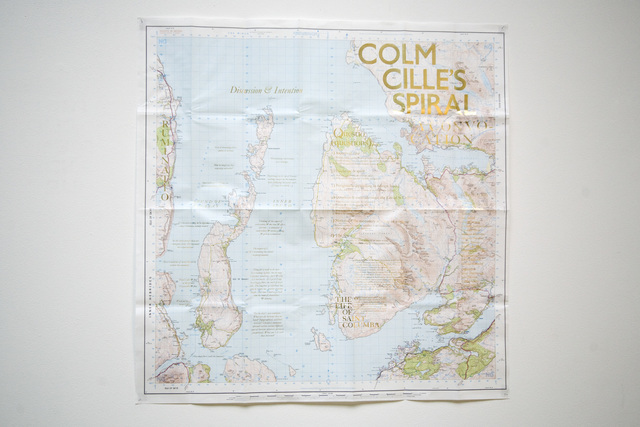 Colm Cille’s Spiral was held in the Mackintosh Museum, Glasgow School of Art from 12 Oct–1 Nov 2013, and as part of the Derry–Londonderry City of Culture project in the London Street Gallery from 30 November–14 December 2013.